Warm olive oil. Add garlic and red pepper flakes to skillet, then anchovy. Let anchovy disintegrate, mashing it with a wooden spoon. Do not let garlic burn. Add tomatoes to the sauce. Add olives, if using. Cook until tomatoes reduce their volume by half. Taste for salt and pepper. Add mint to the sauce. Stir. Stir in drained cooked pasta, toss, then serve immediately. 08 Jun	This entry was published on June 8, 2011 at 10:27 pm. It’s filed under cooking, food, food photography, general, Italian food, summer and tagged anchovy, cooking, dinner, food photography, mint, olives, pasta, recipe, spaghetti, tomatoes. Bookmark the permalink. Follow any comments here with the RSS feed for this post. 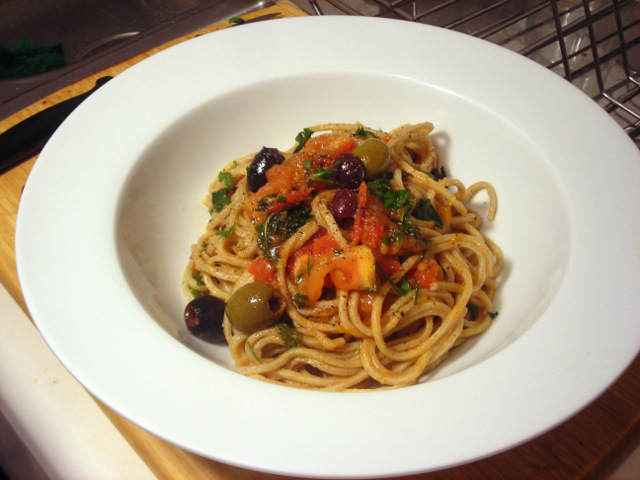 anchovy and mint sounds wrong – but definitely worth a try to see how wrong I am. It’s actually a fairly common flavor combination in the cuisines of Umbria, Emilia-Romagna and Sicily.